To know if you have the right equipment (used saddles for sale, here ! ), you have to wonder if your saddle fits your rider/horse combination. With a pencil, check the center of gravity of the saddle on the horse's back: rolling, the pen must be at middle seat. Basically, if your pencil is ahead or behind the saddle, it's not good. The pommel and cantle are supposed to be at the same height when viewed in profile, otherwise it is a sign that the saddle is too narrow or too wide. Placed behind the horse, you must see column all along the saddle, and you should be able to see the light on the other side. Withers must be free : once in the saddle, you should be able to pass three fingers above the shoulder and two fingers on the side. In the saddle, you have to slide your hand under the seat at the shoulder of the horse, otherwise the arch is too narrow. 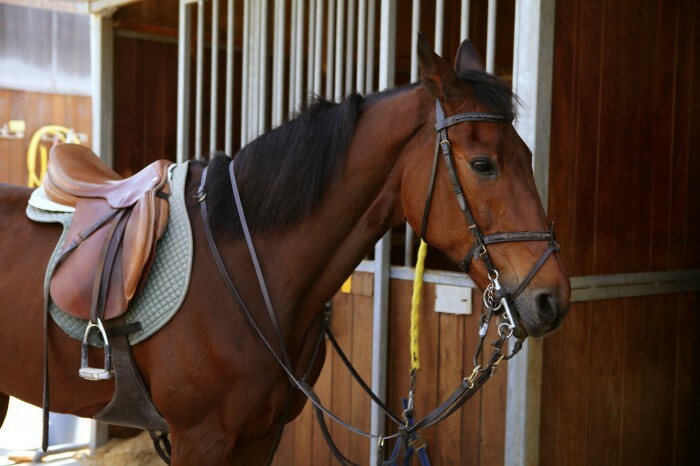 Once strapped the horse, the girth must be vertical to the floor and place one hand behind the bend of the horse. Once you finished up your horse, traces of sweat (on the horse's back and on the saddle cloth) must be absolutely symmetrical and uniform, otherwise sign of pressure from the saddle. The saddle should not touch the vertebrae, above and on the sides. The seat must not rest on the lower back (in the loins). The saddle should not touch the shoulders. The linings should be wide enough. The better, because the rider can judge its comfort, is to test in saddlery, different seats and sizes or choose the one you feel best (there is one hand behind your butts until cantle).